If this is the first time you are visiting our website, congratulations to you and let me be the first to welcome you aboard. Something has aroused your curiosity and brought you to this location. I’ll bet your wondering: “what kind of an organization are we and why would I want to join?” I know exactly how you feel because I was in the same position several years ago. Well, let’s start by explaining what we aren’t: we aren’t a group of old veterans sitting around drinking beer and telling each other war stories. Quite the contrary, we are a concerned group of patriotic veterans who feel compelled to speak out about the rising culture of militarism pervading our country and act in order to push back this blood-painted trend. Have you ever found yourself yelling at the TV? I’ll bet you were watching the national news and trying to digest, in one night, all the bad news without going completely nuts. You turn off the TV and continue to mutter to yourself or worse take it out on a family member. The dialogue goes something like this: “what the hell is going on with our government. Why can’t they see what needs to be done and why aren’t they doing something to correct the total mess and inaction that is dragging our country and its people down?” Your head hits the pillow that night and a profound feeling of hopelessness overcomes you. I think that many experienced something very similar, but don’t become discouraged. You can constructively use some of that pent up emotion by joining us to visit your congressional representative in person in an attempt to influence the policymakers in the federal government. It may sound intimidating, and indeed, for an individual, meeting with a congressperson is an arduous task which few can carry out effectively: it requires securing a time slot for a meeting, researching an issue and delivering a compelling presentation. As a result, rarely do individuals get a chance to meet with their representatives. And when they do, one voice is just that: one voice against the well funded interests of the Military Industrial Complex. 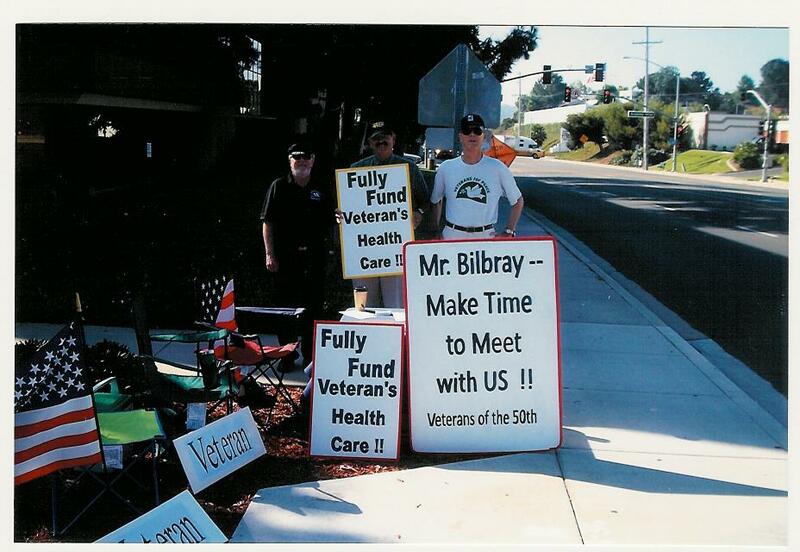 Starting in 2004, our chapter of Veterans for Peace has engaged in regular meetings with congressional representatives from the San Diego area and developed substantial experience in this venue. From our experience we came away with the overriding conclusion that one must have an extra amount of tenacity in order to get an audience with congresspersons. Some of them are accommodating, but for the most part, they attempt to avoid meeting with constituents because they are “busy elsewhere.” In many cases we had to repeatedly email and call the congressional offices to get an appointment. In some cases, we actually picketed their office and embarrassed them into meeting with us, but in the end we have always succeeded! Briefly, the process includes: setting up appointments via congressional staff, organizing the delegation, collectively crafting an effective and personalized message, developing reference material, and finally following up on our demands after the meeting. Carrying out a meaningful and effective visit to congresspersons takes a considerable effort but it may seem almost effortless when done by a group of dedicated and experienced activists. So if you are a person who would like to engage in a firm, polite and pragmatic conversation with your congressional representative on issues such as the costs of war, the rise of militarism in our culture, and the use of the armed forces as an instrument of foreign policy – among others as outlined in our statement of purpose – we encourage you to join us. We do not expect you to have experience in dealing with congress; but we want and need your conviction and enthusiasm. Usually, we plan meetings with each representative annually, thus it takes very little individual effort to engage in this meaningful pursuit. End ongoing wars in Iraq and Afghanistan. Take action on the alarming amount of suicides amongst our active duty and veteran military personnel. Victims of Agent Orange Relief Act. Close a substantial amount of the military bases around the world. Substantially reduce the Department Defense Budget. Rarely do congresspersons immediately share our vision on many of the above issues, and they commonly respond with unambiguous inaction. But we believe that by making our opposition to the wars in Iraq and Afghanistan loud and clear, we helped tilt the positions of some of our congresspersons against preemptive war. We still have a ways to go, but we are optimistic in the power of the collective influence of the people on the federal government to enact foreign policy which benefits the people not the small political elite. San Diego Veterans For Peace Speak Out on War! Website issue? Email the webmaster.